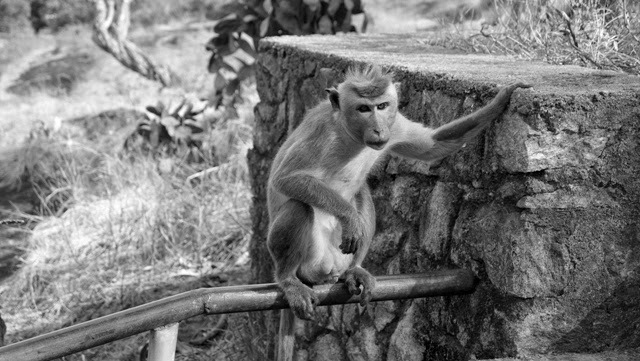 STORY: Monkeys often elude me. It must have been the movie Outbreak that shifted my worldly view of this primate. I've experienced many unfortunate incidents with Monkeys. In Batu Caves of Gombak District in Malaysia, i was attacked by a dozen of them. All eyes were on my ice cold can of soft drinks. It was one o'clock in the afternoon then. The heat was exhausting, and i assume the monkeys have not had their lunch break. I threw my almost full drink in desperation. It's enough that i climbed up to 272 steps only to find out there are more of them inside the cave. In Ella of Uva Province in Sri Lanka, i seeked the help of a bystander to help me out get rid of a troop along the highway. Instead of riding the bus up and down the infamous highway, i decided to walk that day. It was a grueling and tiring walk but i managed like a pro. Halfway my climb up, i saw these wild creatures roaming around the trek point. Some where doing stunt tricks in the branches of the trees, others were simply people watching. It didn't help that i stumbled upon an angry dog with half of a monkey's body in his throat. I am not a fan of wild animals but right then, who am i to complain. I am visiting their territory. I am but a nobody. The man who was busy conversing on his mobile phone, pressed the dial tone and said goodbye to his girlfriend, got out of his car and accompanied me till i pass by the monkey corner. He waved his hands as a sign that i'm safe. 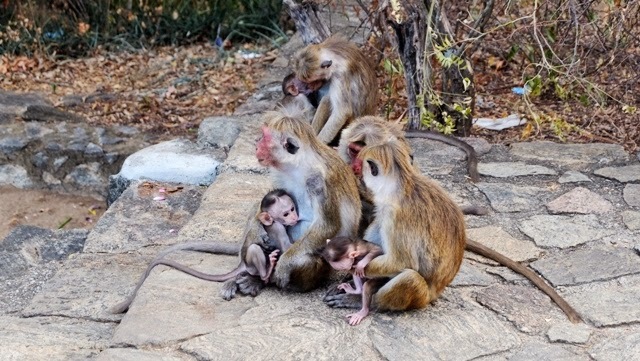 But the real story here is about the family of monkeys in Dambulla of Matale District in the Central Province of Sri Lanka. As you climb up the tiring cave temple, you will see hundreds of them hanging around like little villagers. 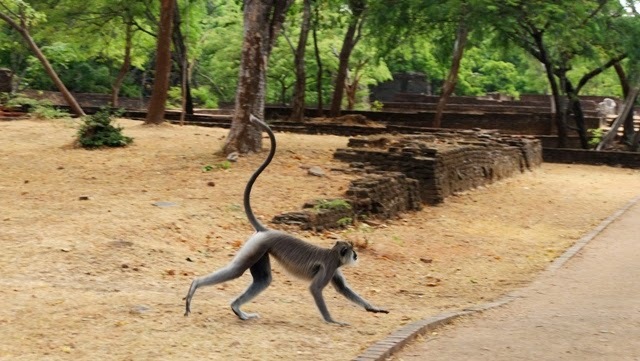 Later i found out that these breed of monkeys are called Toque Macaque, "Rilewa" in Singhala, and are endemic to Sri Lanka and more importantly, are currently endangered. Again, my fear grew as i try to avoid any contact within 50 meters, which is impossible considering there is only one route up and down. After two hours of praying and meditating on top, i was ready for more passive aggressive encounter. When i saw this family on one corner, my ultimate view shifted 180 degrees. It's not everyday that you get a more personal and intimate interaction with Macaques in the wild. Much more, when you see a complete family. This may sound too shallow but indeed, I've never felt more safe than with them. They are the most gentle monkeys I've ever encountered. They are simply at peace. I was unbelievably surprised. People take photographs, like myself. Some where even too close, the little animals had to run away in fear. Everyone was so happy to see these monkeys. I left after three days, and found myself in Polannaruwa in front of one of the greatest Buddhist structures of the world. There were a handful of the similar kind of monkeys but different. These are called Grey "Hanuman" Langur and are believed to be incarnations of Hindu monkey god, Hanuman. I found myself a little corner, sat and watched in admiration these beautiful species. These type are graceful, with pale gray coat, dark face and long eyelashes. Along came three after a few minutes and sat beside me. I didn't move a muscle out of fear, i looked at them, and we were eye to eye. I am home with my new found friends. TIPS: Avoid close contact with monkeys in the wild. If they feel threatened or annoyed, you're in bad luck. Never eat in front of them or show food in their presence. They are absolutely sensitive to odor, noise and/or shiny objects. Be friendly. RECOMMENDATIONS: In case of a monkey attack, throw your food in their direction right away. Get away as far as possible. If you don't have food, open your hands to show you don't have one. Put a barrier between you and the monkey to avoid physical contact.